Social Security, also known by its acronym OASDI, or “Old Age, Survivors, and Disability Insurance”, pays benefits to many individuals. Worker’s benefit: A monthly income for a retired or disabled worker. Spouse’s benefit: Monthly income for the spouse or former spouse of a retired or disabled worker. 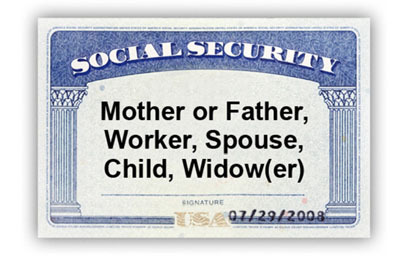 Widow(er)’s benefit: Monthly retirement income for the surviving spouse or former spouse of a deceased worker. Child’s benefit: Monthly income for the dependent child of a deceased, disabled or retired worker. To receive benefits, the child must be under age 18, over age 18 and attending elementary or high school full-time, or over age 18 and disabled before age 22. Mother’s or father’s benefit: Monthly income paid to a surviving spouse who is caring for a worker’s dependent child who is under age 16 or disabled before age 22. If under age 62, the spouse of a retired worker receives the same benefit. Parent’s benefit: Monthly income paid to the surviving dependent parent or parents of a deceased worker.